How does one become a leader? Is it something we are born with or is it a skill we develop over time? Some say, “Leaders are made, not born. “ While others argue, “Leadership is either something you have, or something you don’t have.” The leadership debate is one that continues to rage on, however most would say that leadership is a skill we can develop over time. Some naturally learn faster than others and seem to have a knack for leadership. If you want to become a leader, where do you start? 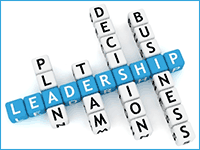 What does one study or do to become a leader? The first step in becoming a leader is to decide to be a leader. This may sound trivial, but as Andrew Carnegie, creator of the steel industry and at one time the wealthiest man in the world, once said, “The starting point to all achievement in life begins in the form of a clear concise mental picture of the thing one seeks.” Leadership is not an easy position and it requires a lot of work and responsibility, but the rewards are great! Deciding to be a leader is one of the best decisions a person can make, however it is not the easiest. Leadership must be present in all areas of your life, not just work. Being a leader means always taking the high road, doing things others won’t do because they are not convenient or easy. Leaders are controversial because they are always pushing the envelope of change. Most people will choose to remain complacent and the leader’s action towards change and growth will make them uncomfortable. It is the leader’s responsibility to blaze a new path and once this path is clear and viewed as “safe” by others then they will follow the leader. Growth is not an automatic process and as a leader, you must force yourself to constantly grow, learn and do new things. The most effective way to be a leader is to lead by example. Simply barking orders or telling others what to do will not make you a leader. This is the difference between a manager and a leader. The manager wishes to maintain or manage the status quo. A leader pushes forward to cause growth by doing more than anyone else he leads and setting a high expectation for his people to follow. The old saying, “Don’t ever ask someone to do what you are not willing to do yourself” could not be a truer testament of what leadership means. Taking this action versus the, “Do what I say, not what I do” mentality, builds respect, trust and loyalty. People love to fight with, and for, a leader who is in the trenches and knows the fight just as they do. Providing a strong example for people to follow is just another step in the journey of becoming a great leader. The bottom line is people want to follow someone they like, trust, and look up to. To be an effective leader you must first decide to live a life of leadership. You must continue to grow and expand into uncharted territory and always provide a strong example for others to follow. The world needs strong leaders in schools, churches, families, companies, and organizations today more than ever. Make the decision to be a leader. You won’t regret it!